A couple of days ago Opera 11 was released. 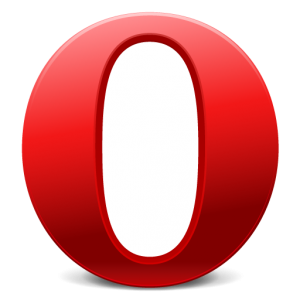 The new release of Opera has generated great interest from users resulting in record download numbers for Opera. 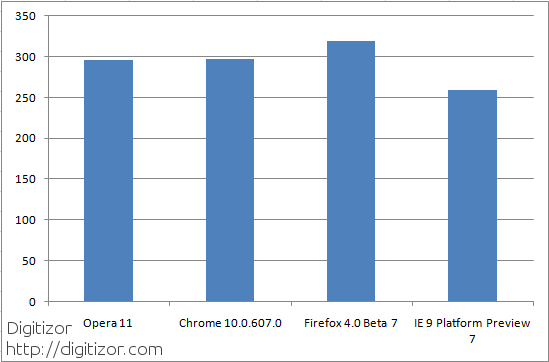 Today we decided to benchmark Opera 11 to see how it stack up against the latest that other browsers are coming up with. The other browsers we have included are Google Chrome 10.0.607.0 Canary Build, Firefox 4.0 Beta 7 and Internet Explorer 9 Platform Preview 7. None of these are stable builds and are meant for only feature testing. Let us see how Opera 11 do against these. In this benchmark the Y-axis represents time in milliseconds. Lower scores (time) are prefered in this benchmark. 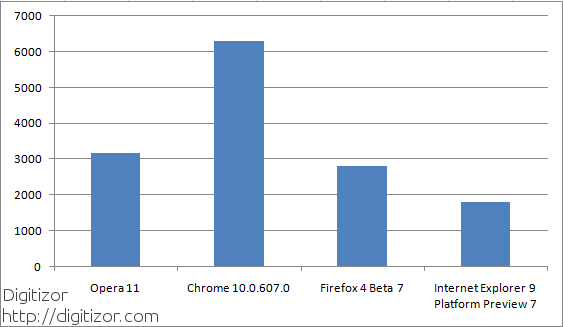 In the SunSpider Benchmark, Opera 11 and Google Chrome are neck to neck. In fact, Opera 11 is 2 ms faster than Google Chrome. The Google Chrome used on this test is the Canary build with Crankshaft - no way near being available in the stable channel. This is very impressive stuff from Opera 11. 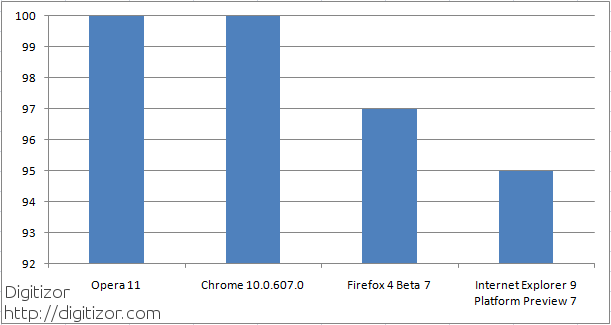 Firefox was the slowest of the lot but by only around 20ms compared to Chrome. Internet Explorer managed to get in a little more than 250ms. However, because of the recent incident with its dead code elimination, I will not draw any conclusion. The V8 benchmark is the one Google uses to benchmark Chrome. In this benchmark, higher scores are better. In this benchmark too Opera 11 does very well. It managed a score of above 3000 which is very impressive. Chrome's crankshaft really kicks into high gear in this benchmark and it scores an imposing score of over 6000. The performance of Firefox is not too bad either. It scored just under 3000 - damn impressive if you consider the scores of the current stable build. Internet Explorer is really a letdown here. It could not reach even 2000. In both of these benchmarks Opera 11 managed to come second. Since it is a stable build against development builds, Opera's performance is all the more impressive. As browsers evolve, they become more and more complex. This has an impact on the memory usage of the browsers. In powerful machines, this is rarely a problem but it could be a problem in less powerful machines. Here we have only Opera, Chrome and Firefox. Since Internet Explorer 9 Platform Preview does not come with a proper user interface, we did not include it here. The X-axis is the number of tabs opened and the Y-axis is the amount of memory the browser is taking up in KB. Of course you want the browser to use as little memory as possible, so Firefox is the clear winner here. Opera's performance is somewhere between that of Firefox and Chrome, which takes up a huge amount of memory. Opera 11 takes up a little less than 500MB with 25 tabs open. This is not comparable to Firefox, which does an amazing job at only a little over 300MB. However, it is a lot better than Chrome's 600MB. This test is done using The HTML5 Test. It is not a test of how a browser performs on the features provided by HTML5. It only test how well the browser supports the HTML5 standards. Higher scores are better here. Chrome emerges as the winner here followed by Firefox. Firefox's test here is a huge improvement over the stable release. Opera's score is unexpected. With Opera's focus on web standards, I expected Opera 11 to score a little higher. 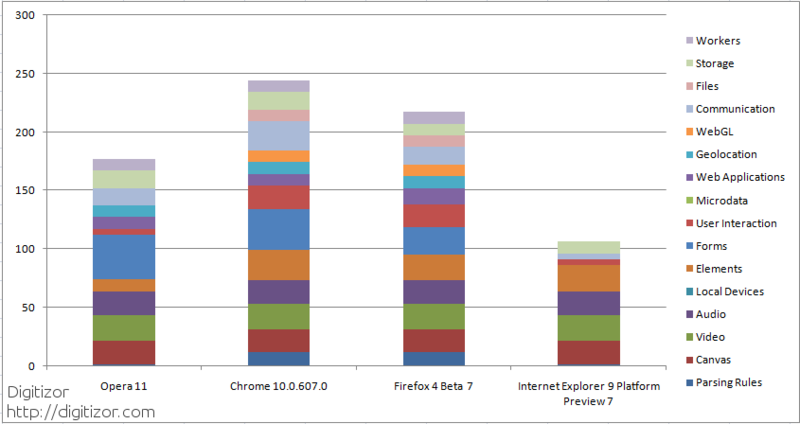 Internet Explorer scores the lowest with support for less than 10 out of the 16 parameters. Both Chrome and Opera scores 100/100 in the Acid3 test. So, both of them passes the test. Firefox and Internet Explorer are yet to pass it with scores of 97 and 95 respectively. After putting through Opera 11, which is ready for normal use, with these browsers which are at the bleeding edges of their development, Opera held its ground firmly in all the tests. With support for extensions already available, there is no reason why you should not try it. Click the link below to download.